The easiest way do create a festive mood is to decorate your doorway with a beautiful wreath. 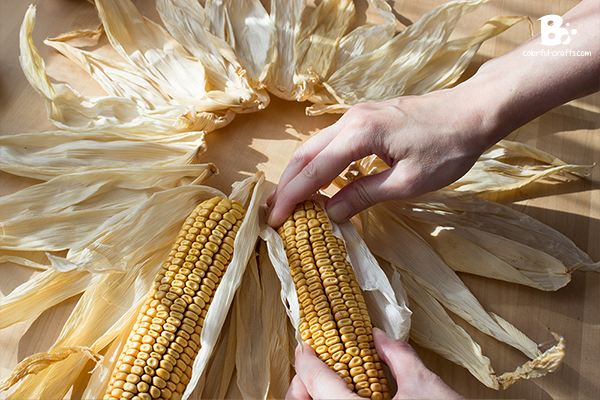 In this case a pretty corn wreath. This craft is really easy and it takes only a few minutes. (10-15) It even works as a last minute Thanksgiving Decoration. 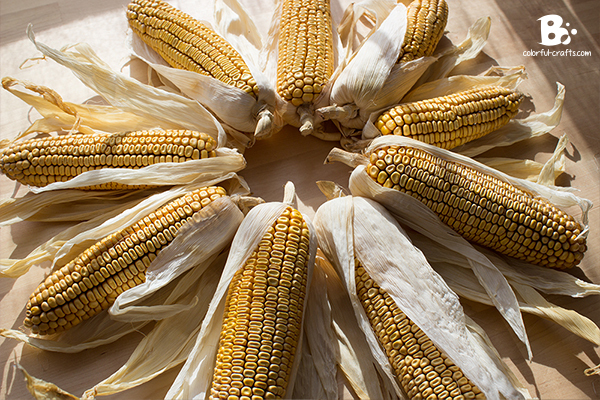 I collected the corn cobs myself this summer, but it should be no problem to buy them this time of the year. 🙂 It should be dried corn for decoration purposes. I bought the wire rings from a florist’s supply, but a thick cardboard disc would work even better! 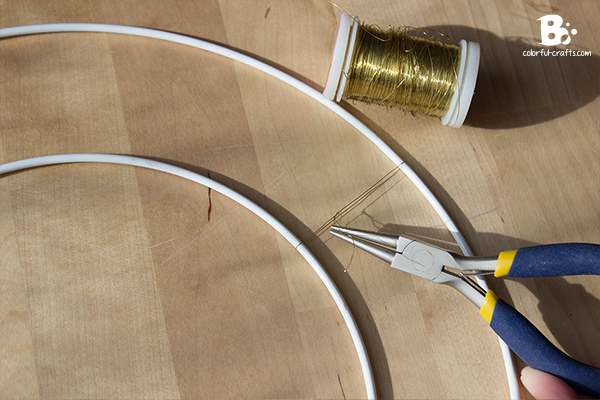 Because I couldn’t find a big enough piece of cardboard at home, I made do with two wire rings. I connected them in some places with florist’s wire. You could also use a strong tape. The only important thing is, that it should be stable and durable. The corn cobs will add quite a bit of weight in the end. But as I said, if you have strong cardboard, cut out a disc and use that. 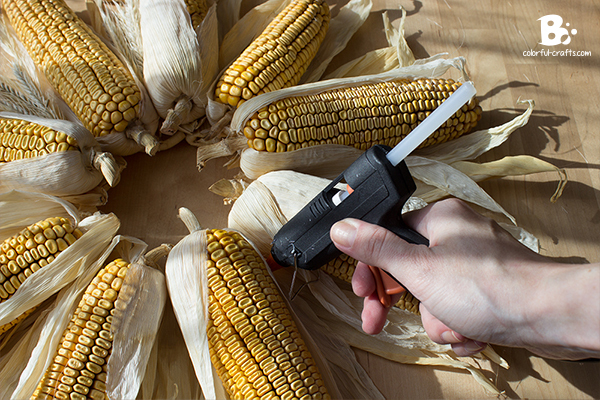 Put some glue on the wire with your glue gun and press down the corn leaves. I took care to face the tips of all the leaves outwards. 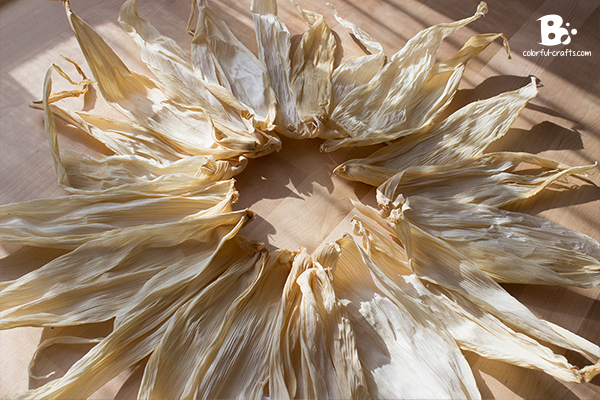 When I collected the corn cobs, I peeled off some expandable leaves and used those. 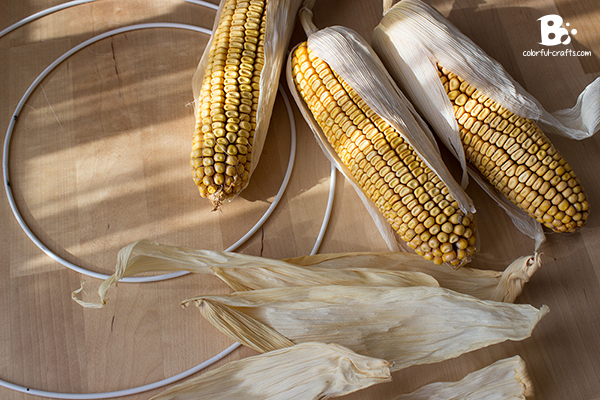 I just left 1 – 2 leaves on each corn cob. 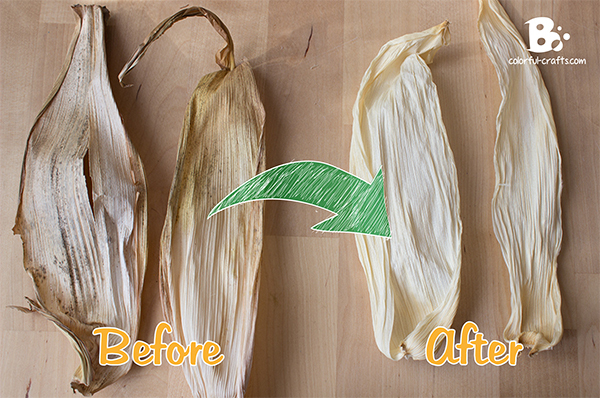 Because I collected the corn directly from the field, my leaves were discolored and looked a bit mouldy. That’s not a very pretty look for a craft project! I fixed that by putting the leaves overnight into a bucket full of water and added a fair amount of chlorine cleaner. (bleach) Then I spread them out on an old towel and left them to dry. It worked out really well, as you can see in the picture above. Just take care to overlap the leaves slightly on the sides (to avoid gaps) when you glue them down. 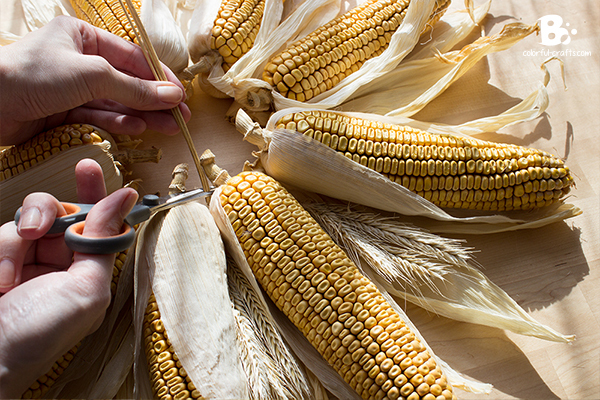 Before you start gluing down the corn cobs, lay them out on the wreath and try to find the best position for them. I had to adjust the spaces between them a little, to make them look more even. 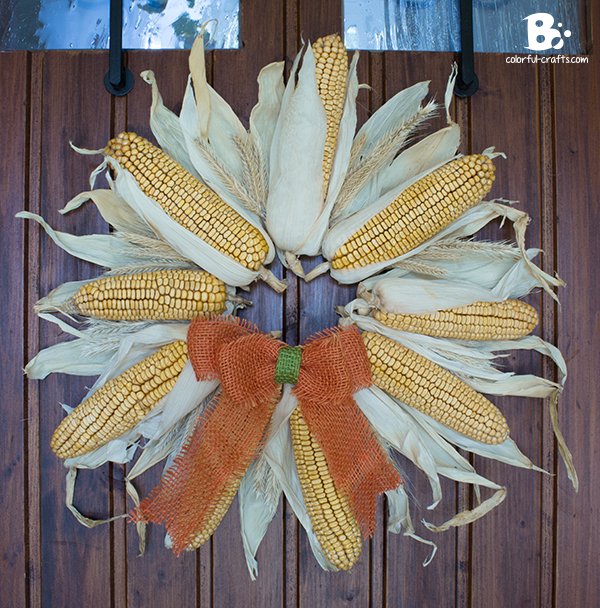 Use a lot (and I really mean a LOT) of glue on each corn cob and press them down on the wreath for some time. 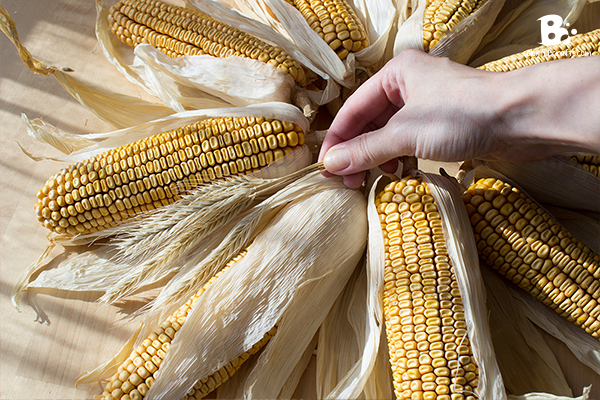 Since the base of your wreath consists of so many layers of leaves, you should lift each corn cob slightly after you glued it down. Test if it is secured to the base or if you have to add some more glue between two leaves. This is again a point where you could stop with your craft and just leave it at that. I myself however had some more details in mind. More precisely I wanted to add some ears of wheat. I also collected them on a field. But this step is completely optional. You could also add some other details or just let it be. 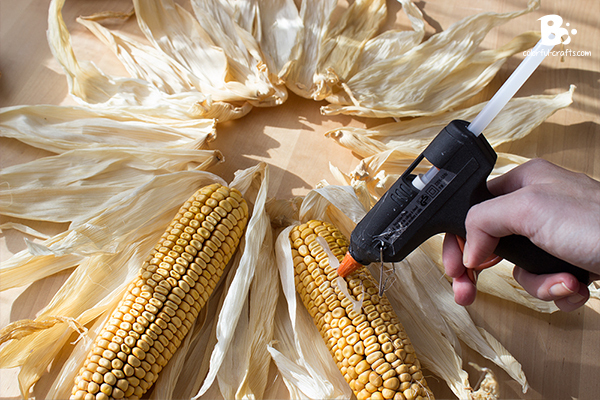 Put a big glob of glue between two corn cobs. 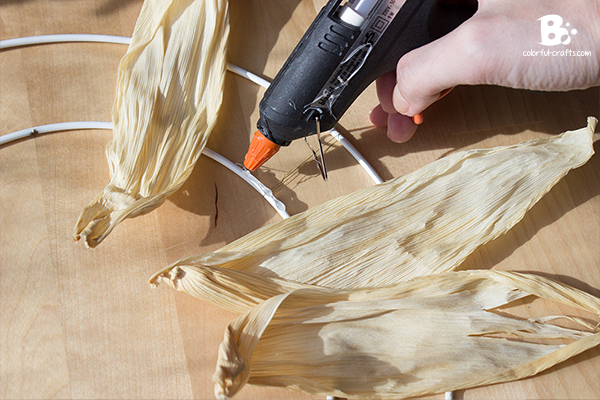 Take some ears of wheat (I used 3 – 4 for each bundle) and press down the stems into the glue. Wait till the glue is dry and remove the ends of the stems with some scissors. And that’s it! 🙂 I added a big bow and called it a day. I think burlap works really well with the other materials. But you can use whatever you like (or have at home). The whole project took me under 10 minutes to finish.